The eMerge® E3-Series represents the next step in the evolution of Linear’s access control platform, delivering faster set-up, enhanced features, and industry-leading scalability that outperforms the competition. Linear HSLG SERIES - Industrial / commercial duty slide gate operator series, available in 1/2, 3/4, and 1 horsepower, various supply voltages and phases, 10" per second gate speed. Linear SLC 1 HP slide gate opener (also known as a Linear slide gate operator or Linear slide gate motor) is a slide gate opener for gates up to 45ft. and 2000 pounds. Linear SLR slide gate opener (also known as a Linear slide gate operator or Linear slide gate motor) 1/2 HP is a slide gate opener for residential gates up to 500 lbs and 25 ft. 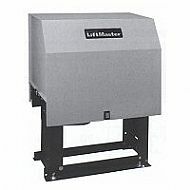 Linear SLC 1/2 HP slide gate opener (also known as a Linear slide gate operator or Linear slide gate motor) is their slide gate opener for gates up to 37 feet and 1000 lbs.